Prices include Hopper Duo for qualifying customers. Hopper, Hopper w/Sling or Hopper 3 for $5/mo. more. Upfront fees may apply based on credit qualification. Fees apply for additional TVs: Hopper $15/mo., Joey $5/mo., Super Joey $10/mo. All offers require credit qualification, 2-Year commitment with early termination fee and eAutoPay. Qualification: Advertised price requires credit qualification and eAutoPay. Upfront activation and/or receiver upgrade fees may apply based on credit qualification. Offer ends 07/10/2019. 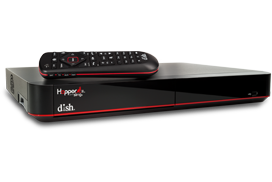 Included in 2-year price guarantee for additional cost: Programming package upgrades ($69.99 for AT120+, $79.99 for AT200, $89.99 for AT250), monthly fees for additional receivers ($5-$7 per additional TV, receivers with additional functionality may be $10-$15). Premium Channels: 3 Mos. Free: After 3 mos., you will be billed $30/mo. for Showtime, Starz and DISH Movie Pack unless you call to cancel. Hopper: Hopper Upgrade fee may apply based on credit qualification. Commercial skip feature is available at varying times, starting the day after airing, for select primetime shows on ABC, CBS, FOX and NBC recorded with PrimeTime Anytime. Watching live and recorded TV anywhere requires an Internet-connected, Sling-enabled DVR and compatible mobile device. Recording hours vary; 2000 hours based on SD programming. Equipment comparison based on equipment available from major TV providers as of 1/1/17. Watching live and recorded TV anywhere requires an Internet-connected, Sling-enabled DVR and compatible mobile device. Other: All packages, programming, features, and functionality and all prices and fees not included in price lock are subject to change without notice. Upfront and additional fees may apply. After 6 mos., you will be billed $9.99/mo. for DISH Protect unless you call to cancel. After 2 years, then-current everyday prices for all services apply. For business customers, additional monthly fees may apply. Free standard professional installation only. SHOWTIME is a registered trademark of Showtime Networks Inc., a CBS Company. STARZ and related channels and service marks are property of Starz Entertainment, LLC. Internet speeds, prices, and providers vary by customer address. Restrictions apply. 25 Mbps internet service available nationwide, but may become temporarily unavailable to certain addresses based on local beam capacity. Availability is subject to change without notice. Internet not provided by DISH and will be billed separately. Call for details. Courtesy of GoDISH.com for credit-qualified customers. Customers who do not qualify may be eligible for a secondary gift offer. Cards are issued by Citibank, N.A. pursuant to a license from Visa® U.S.A. Inc. and managed by Citi Prepaid Services. Cards will not have cash access and can be used everywhere Visa® debit cards are accepted. Cards expire 6 months from date issued. Mail-in redemption form is required within 60 days of qualified activation to receive gift. Customer account must be current and in good standing at the time of redemption. Allow 6-8 weeks for delivery of gift. © 2019 GoDISH.com. All rights reserved.